We are delighted to present you our next Brand Ambassador who is known also as our Candy Trainer. Ileana, a very jolly person, believes that the hiccups on the road helped her grow into the person she is today. 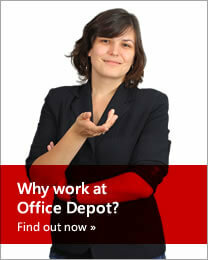 More details about her detailed trip in Office Depot you can find below. I like to think about myself that I’m a smart and not always a predictable person; I also like to laugh a lot and to be near people that make me laugh. So, that’s the kind of description that is not job related but I do apply these “rules” at job. I’m always cheerful, rarely sad or upset. Well, there are days when it’s raining but you have to see the positivity in all that you do and see around yourself. You have to enjoy every little thing – even shopping in supermarket makes me happy. I’m really careful about what I eat. It’s a personal plan that I’ve managed to implement for 2 months now: I have a nutrition plan, work out for 5 days a week and have a personal trainer. Things that I wouldn’t have thought of some years ago. I wasn’t aware of what I was eating and I was inconsistent with what I ate, what time I ate. So, it was like a life-changing switch. It’s 3 meals a day and 2 snacks now. It came like a click and told myself if I don’t do this in this moment I won’t ever do it. What I do now is like when you prepare your coffee and add milk and cinnamon and that makes you happy. My colleagues made the joke the other day: they said I’m like Nescafe 3 in one. I’m a technical trainer and a quality specialist for the Cash Application teams. New hires in this department are having trainings and for cash agents I verify their work and provide feedback. Basically, I take care of the health of the process. It’s a job that makes you realize what the problems are, you take the pulse of the process and when you spot a problem you act on it. My first job title was Process Analyst in Collections. Basically I spoke to customers and collect the money they owned. It was a very tough process at the beginning because we were thought by our colleagues in UK. It was very hard for me to wrap my head around so much information, especially technical info. I was fascinated by their British accent and the fact that I talked with so many British customers it made me realize that I had to do something about that and adopt their accent. My first day in Office Depot was when I arrived 30 minutes late and I was the last one to arrive. I thought I was in a horror movie when I saw the street there and the fact that I did not find any building with Office Depot written on it. I was walking around the buildings and I was kind of on the point of giving up and go home. I was also thinking to call the recruiter to ask more details about the place. Then I saw some people in front of the building and went to ask them. They replied: ‘Oh, yeah go upstairs and you will find them’. I went upstairs and opened the door and everyone was looking at me. I froze and said: ‘Hi!’. Everybody laughed about this. I spoke also with the Irish customers and I was so amazed by their accent and I had to ask a colleague of mine to handle the call. And then later on I managed to understand them. 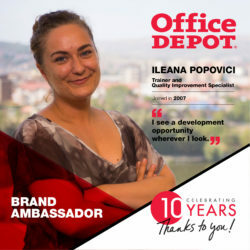 After we moved to Iulius Business Center, Office Depot offered the opportunity to learn Dutch because they wanted to transition the Dutch processes. I was so fascinated about this language that I started the courses and applied for a role on Benelux team. First time I wasn’t accepted because my Dutch was not so good since I was learning Dutch for 2 weeks. The second try was successful I was transferred to Cash Application team. Shortly after, I was promoted and learned the process really well. I got acquainted with almost all the processes, managed to work with so many people and different personalities. To my surprise, the person I was 10 years ago somehow changed and developed. I remained in Cash for the most of time, then got the opportunity to be a Technical Trainer and the Quality Specialist that I am today. 6. What was your biggest achievement up until now? Advise us some tips of how to achieve success in your career. The fact that I learned Dutch at intermediate level. I’m not using it anymore only when I’m going in vacation. I’ve been in The Netherlands and it’s quite hard to understand them. They are warm people and helpful. They are different, especially when riding the bike. We had a colleague who was going by bike 20 km every day to work. They are pretty amazing people. Rarely did I see car in the Netherlands. But the funny thing is that I don’t know how to ride the bike. I am afraid of them because you can fall, you have to pay attention to cars. Here, I think drivers don’t care so much and bikers are not as much respected as they are in the Netherlands. I always call it a development opportunity for each person. A key to success sounds more like a stereotype. If you really like doing something then you should do it. If you don’t feel like doing it, then don’t do it. But you have to be prepared to not regret it. I do regret some things I did not do but my plan is to do them in the future. So, you can always adapt in order to change the course of your life. The fact that I remained here doesn’t mean that I’m stuck here. It’s because I’ve managed to develop myself and saw the opportunity when it appeared. I did have some hiccups on the road but they helped me grow into the person I am today. I always see a development opportunity wherever I look. So when I’m walking I never walk with my face down, I usually look at people passing by. As a fact, each morning when I walk to office I stumble upon an old lady who is walking her dog and I kind of stop and say hi to her even though I don’t know them. Well, those hiccups that I’ve talked about earlier are that I thought I was fit for a role and I didn’t get it. The feedback was constructive. I felt anger at beginning but tried to manage it. Also, I had people around me who helped me decide the next step. We should stress more often looking at the good part of every situation. I see people who are too serious and forget to laugh, to enjoy life a bit. Even if you are sad for a moment, you see/hear your colleague who is doing something funny and you want also to see what is happening. So it’s the little things that make you a positive person, work related or not. Actually I don’t have any motto in life. I was thinking about this: ‘Do I deserve one? Do I really need one?’. I really like seeing people happy and the fact that I’m making them happy or smile is an accomplishment for me. There must be something else than being sad a period of time. I’m an open person so what you see is what you get.